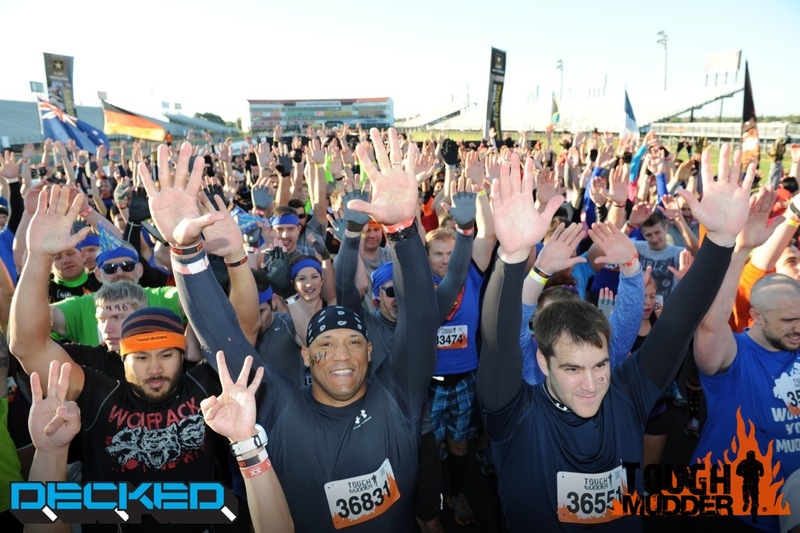 I participated in the Tough Mudder-Houston, TX 2014 event last week on November 1st. Just in case you don’t know what this event is, the “Tough Mudder is a 10-12 mile (18-20 km) obstacle course designed to test all-around strength, stamina, teamwork, and mental grit. Tough Mudder is probably the Toughest Event on the Planet. Probably.” (taken straight from the website https://toughmudder.com/events/what-is-tough-mudder). Tough Mudder is a proud supporter of Wounded Warrior Project® http://www.woundedwarriorproject.org. To date, Mudder Nation has raised over $6 million to support the transition of thousands of warriors returning home from the current military conflicts. How did I get involved? Well to tell the truth I was responding to an impromptu call out by a good friend mine. He issued the challenge and I accepted. I immediately got started the following week training for an event I knew nothing about. I researched and did watch a few videos on the website. I figured if I could just run ten miles then I could manage the rest and be ready enough to at least finish. Besides, I was a professional athlete which meant I felt qualified enough to know how to train and boy was I wrong. The day finally came and I was ready. I called my friend the day before and he tells me that he is not participating. He hurt his toe. Boo whoo. I felt a little let down but I had already committed plus I paid the money! So, I showed up bright and early at the event. I signed the waiver at the front then walked into the event entrance. Since I didn’t know anybody or have a team, I figured that I would just meet another loner and we could pull together as a two man squad. That’s exactly what happened. Once we got going I enjoyed it. I definitely was not ready or in shape enough to really kill it. We had an early obstacle called the “Mile of Mud”. It was crazy. I would be walking then fall into a mud hole bumping my knee and getting dirt in my mouth. I saw people hitting the ground full face plant. There was another obstacle that had several mud holes that we had to climb in and climb out of. This obstacle was super slippery. There was another obstacle called the “Great Wall”. The “Great Wall” was killing em at the gate. People were crashing and sliding all over the place. Some of it was funny but some it made me say” Lord help em”. It looked like one of those skate board walls used at the X games. Plus it was slippery from all the mud people tracked on it. To get up the wall you must get to full speed running start so that you can have enough momentum to thrust you up the wall. People would run out of steam just as they got to the top and would try to jump the rest of the way. It didn’t look good at all. Some people laid down at the top so that as other Mudders would run out of steam and jump they could catch a hold of them by their hands or arms to hoist them up. That was probably the best display selflessness by several people I have seen since my football playing days. Just great camaraderie on display. As for me, I took off running building up a full head of steam as I sprinted toward the wall hoping that I would make it and not look like a deflated balloon once I got to the top of the ramp. I got to the ramp and amazingly and to my super surprise I just kept going and going. I was going so fast that I almost ran over the top to the other side. I was crunk because I made it! So I stopped and I turned around to starting helping others make it. Like I said early, it was a great display of camaraderie. All throughout the event I would see people helping other complete strangers to make it over, under and through obstacles. As I went from obstacle to obstacle I would try to encourage and keep people pumped up to stay in the race and to finish. Everyone kind of had this “We are all in it together attitude.” Mile by mile obstacle by obstacle I would see my fellow Mudders falling off to the side. Some from cramps and some from just not being ready or too out of shape to make it the entire way. The entire event was like a military style boot camp course. There was barbed wired we had to go under, a rope climb; a low wall climb; a large wall climb and a whole lot more. But you can look up the courses and obstacles on-line at https://toughmudder.com/obstacles. I have a lot more stories to share but I think this is probably a good stopping point. I am going to participate again next year but next time I show up I am going to be game ready. I think I am going to recruit a big team. It would be fun to have a whole lot of people competing together who actually know each other. If I am successful at getting a team, my new buddy Robert Fairley will get the 1st invite to join. I forgot to mention. We meet a young lady who is in the event alone, so Robert and me told her she could join our team. We looked out for her the rest of the way. You will see Rob and me carrying her in one of the pictures below. I was sore for at least four days but it was worth the fun and the memories plus I can say “ I finished Tough Mudder 2014”.